With a new surge in popularity of mobile devices, including tablets (iPads) and aggressively app-oriented smartphones (Droid, iPhone), podcasts can be employed in even more settings in both mobile learning and single location-based e-learning. Further, podcasts that form a component of integrated applications (archived webinars, narrated slideshows), can be used in new ways to accommodate conditions and contexts of learning, as well as learner preferences and styles. Audio recordings for ubiquitous learning which involves a combination of e-learning (with laptops) / m-learning (with mobile devices) for both education and professional development and training. Podcasting has been around for 5 or 6 years and has was eagerly embraced by educators and institutions from the beginning. New technologies often revitalize older techniques and technologies. Podcasts are no exception, thanks to new mobile devices and access, with 3G and 4G wireless networks. Podcasts are ideal in all courses and degree programs, particularly business (with case studies), natural sciences (environmental field trips, etc. ), humanities (memoirs and debates), cultural studies, and composition. Podcasts are also used to keep students informed and connected. Podcasts are particularly effective for brief, intensive training, or online college courses that require field work and which incorporate informal learning. They often incorporate newscasts, human interest stories, and investigative journalism. Question: Is mobile learning merely a fad? "Buzz Breaker" panel responded to the question at Meridian Knowledge Systems "Learn and Know" e-Learning Conference in Chantilly, VA, April 19-21, 2010. 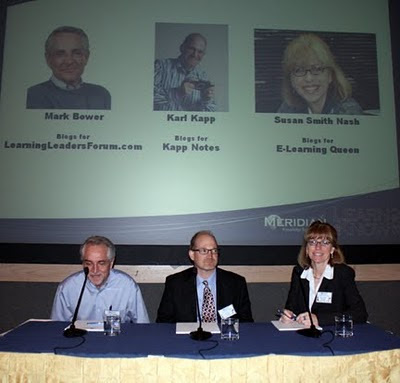 Mark Bower, Karl Kapp, Susan Smith Nash (e-learning and training panel members) discussed the question with corporate trainers. Conclusion: with new mobile devices and expanded connectivity and access, we're likely to be right on the cusp of yet another explosion of m-learning, particularly as different apps are mashed together and there is significant media-mashing (audio with images, etc. ).